Fred Darevil is a French professional mentalist and magician. 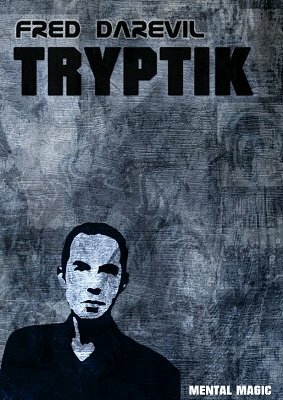 Tryptik is a selection of three effects he's been using professionally for several years with success. Originally sold as a printed booklet by Magic Smith, this ebook version has been updated with more photos, new ideas and subtleties. Larry Becker said about Taxi Gambler: "I like it very much. Your method is very workable. You have created an excellent piece of mentalism for which you have to be congratulated". ONE ONLY: Talking about feminine intuition, the mentalist gives an opaque envelope to a woman in the audience. There is a card inside that will be revealed at the end of the experiment. A committee of men is invited on stage with the woman to verify the fairness of the procedure. A card is now very openly chosen by the woman that proves to be the same as the only one in the envelope. All the cards in the deck except the chosen one are blanks. You offer to sign autographs on these blank cards to spectators who want a souvenir of this experience. Many psychological subtleties are given to obtain the best reaction from this experience. TAXI GAMBLER: You talk about your first trip in Las Vegas and the strange taxi driver you met. You asked him the name of a good hotel and he answered: "We are in Gameland here … So, when a tourist ask me this question I take my special diary for a little game! At each date on this diary I wrote the name of a Vegas hotel. As you can see they are all different. Now I look at a date and... if you guess the name of the hotel I'll take you to this hotel and I won't ask you a cent. If you lose... You'll pay twice the price of the ride!" You offer to the spectator to play the role of the taxi driver and… you win the game, telling him the date and the freely chosen hotel name! SUBLIMINAL CALCULATOR: You are an agent of the famous I.A.P.D.R. (International Agency for Psychic Development and Research). You're going to test the NS4, a neurostimulant which increases subtle perceptions and mental calculation ability, with a spectator. You give him a few drops of NS4 to drink and a complex stereogram to watch for a few seconds. Then he has to freely shuffle five cards with five different numbers on each and small colored discs. Five numbers are now fairly determinate by these free shuffles. Spectator can rearrange cards and discs order before each selection. These numbers are added, the result corresponds to the number coded in the stereogram. This number is printed on the back of the stereogram if the spectator doesn't achieve to see the number directly in the stereogram. Two very different versions of Subliminal Calculator are given, the coded stereogram and special graphics to make official documents of the I.A.P.D.R. 1st edition 2000; updated 2010, 26 pages.